I recently re-discovered the joy of biscuits and gravy and half of me of wishes I hadn’t. The half of me that is going to the beach next week is wishing biscuits and gravy had just stayed a fond memory of a more care-free eating youth. 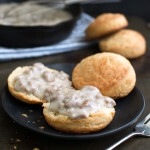 However, the other half of me is happily breaking open layers of these flakey biscuits, watching wisps of steam escape and smiling with joy as I smother them with spoonfuls of creamy sausage gravy. It’s a tough dilemma. The biscuit loving half usually wins out. Who can resist all the light and flakey layers of a beautiful biscuit? These biscuits are all about the flakey layers which are just hefty enough to handle the gravy without being dense and tough. I tried two other biscuit recipes before finding this one. The first recipe produced biscuits that were too dense and made the whole dish feel heavy. The second recipe I tried was my go-to biscuit recipe which produces a very light and fluffy biscuit. However, those biscuits, as good as they are, don’t stand up well to gravy. I needed a biscuit that was the right balance of lightness and heft. I found the solution in a recipe from Cook’s Illustrated. Their recipe produces a layered biscuit which is the result of rolling and folding the dough multiple times. The layers was what was missing from my previous two attempts. The recipe calls for grating frozen sticks of butter into the flour to help the biscuits stay light. I was sure that was an unnecessary step and used a food processor to cut in the butter for the biscuits I used in this photo shoot. I was wrong. This batch of biscuits weren’t nearly as light as the previous batch I had made using the grating technique. The biscuits were still good but not as light as they could have been. I would also follow Cook’s Illustrated technique to cut the biscuits into neat squares with a knife rather than using a round cutter. I used a round cutter for the biscuits in the pictures and, again, the biscuits weren’t as light and flakey as before. Essentially, Cook’s Illustrated knows their stuff and I should just follow their lead. Perhaps, one day, I’ll re-shoot these biscuits to show you how flakey they can be but my brain is already at the beach so this is as good as it’s going to get for now. Happy Holidays. Whisk flour, sugar, baking powder, baking soda, and salt together in a large bowl. Get one stick of butter from the freezer, unwrap it and coat it lightly in the flour mixture. Then grate 7 tablespoons from the stick of butter directly into the flour mixture using the large holes of a box grater. Reserve the last tablespoon of butter for later. Repeat with second stick of butter. Toss grated butter and flour mixture together gently to combine. Add buttermilk to flour mixture and fold with a spatula until ingredients are just combined. The dough will still be dry and crumbly at this point. Transfer dough to a liberally floured surface. Dust more flour on the surface of the dough and using floured hands, press the dough together into a rough 7-inch square. Roll dough into a 12 by 9-inch rectangle with short side parallel to edge of counter. Starting at bottom of dough, fold into thirds like a business letter, using a bench scraper or metal spatula to release dough from counter. Press top of dough firmly to seal folds. Turn dough 90 degrees clockwise so that short side is parallel to edge of counter again. Repeat rolling into 12 by 9-inch rectangle, folding into thirds, and turning clockwise 4 more times, for total of 5 sets of folds. After last set of folds, roll dough into 8 1/2-inch square about 1 inch thick. Transfer dough to prepared baking sheet, cover with plastic wrap, and refrigerate for at least 30 minutes and up to overnight. When ready to bake, heat oven to 400 degrees. Melt the reserved 2 tablespoons of butter. Set aside. Transfer chilled dough to lightly floured cutting board. Using a sharp, large knife, trim 1/4 inch of dough from each side of square and discard. Cut remaining dough into 9 squares. You can flour the knife if it sticks to the dough. Arrange cut biscuits at least 1 inch apart on baking sheet. Brush tops of biscuits with melted butter. Bake until tops are golden brown, 15 to 25 minutes, rotating sheet halfway through baking. Transfer biscuits to wire rack and let cool slightly before serving. While biscuits are baking, cook sausage in a large cast iron skillet over medium heat, stirring occasionally and breaking up any large chunks of meat with a spatula or wooden spoon. Cook until sausage is browned and cooked through, 5-8 minutes. Transfer to a small bowl with a slotted spoon. Add butter to drippings in pan and melt over medium-low heat. Whisk flour into butter mixture and cook, whisking constantly, for about 2 minutes. Try not to let the mixture brown. Gradually add milk, whisking until incorporated. Reduce heat to medium-low and cook gravy, whisking occasionally, until thickened, 8-10 minutes. Stir in sausage; season with salt and pepper. Serve gravy over warm biscuits. The dough will look very dry until you have rolled and folded it a couple of times. Don’t be tempted to add more milk. You shouldn’t need to drain off any of the drippings unless you have an excess amount (like more than a couple of teaspoons). Recipe for biscuits adapted from Cook’s Illustrated. Recipe for gravy adapted from Bon Appétit, Oct 2015.